A few weeks ago a friend asked if I had a good white chocolate cake recipe to make for her daughter’s birthday. The answer was no. I’d made a few white chocolate cakes, but couldn’t recall one where the white chocolate really did anything special for the texture or flavor. In fact, all I could remember was white chocolate making the cake greasy. So my friend improvised and made another cake, while I spent the next couple of days searching on and off again for a good white chocolate cake. 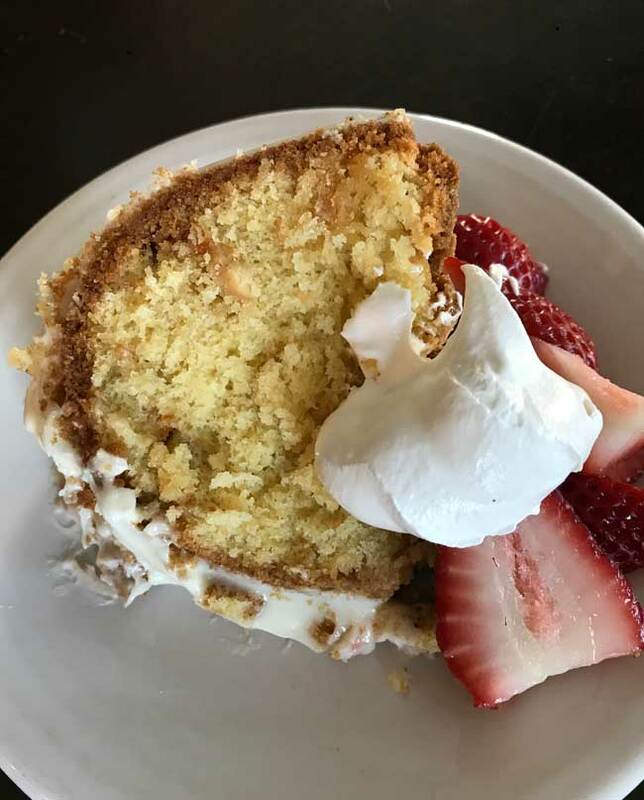 I made a mental note to try Rose Levy Beranbaum’s White Chocolate Whisper Cake and went on with life, then last week I was flipping through a Mrs. Fields’ Great American Desserts cookbook and this recipe appeared — White Chocolate Bundt Cake. 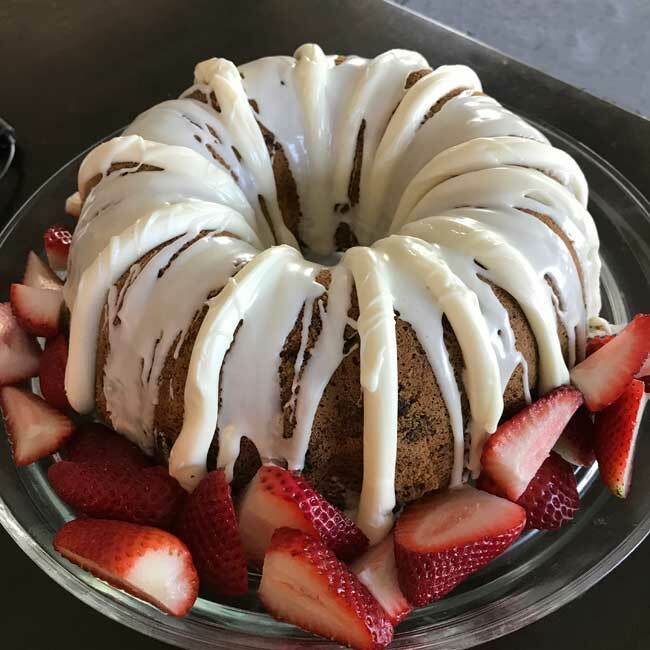 I wasn’t sure how great White Chocolate Bundt Cake would be or whether it would be worth the money spent on white chocolate, but I’m pleased to say it is excellent and that you can definitely taste the white chocolate. I used a bar of Lindt for the 4 oz chopped white chocolate and Ghirardelli chips for the chocolate chips that go in the batter. As for the ganache, I skipped it completely and just drizzled softened canned Betty Crocker cream cheese frosting down the sides. Yes, it was a total cheat but with the strawberries and the whipped cream it tasted pretty good. Next time I make it with the white chocolate ganache. Okay, so now I have to admit why I cheated on the white ganache. You see, when I pulled the cake out of the oven it smelled wonderful and looked pretty, but I realized I’d left out the full cup of sour cream! Since I wasn’t sure the cake would be worth eating, I didn’t want to waste money on the ganache ingredients and opted for the cheaper, easier icing. I also haphazardly drizzled the the icing on thinking the cake would be a disaster anyway. So you know how I mentioned above that I was pleased with the cake? I was happy and relieved that I didn’t have to throw out a whole cake. I’ll definitely be baking this again and will add the sour cream, but even without it was still good. White Chocolate Bundt Cake with melted chocolate and un-melted white chips in the batter. In a bowl, sift or just whisk together the flour, baking powder, baking soda and salt; set aside. In the bowl of a stand mixer fitted with the paddle attachment, beat the butter and sugar until light and creamy, stopping to scrape bowl often. Add the extracts, then add the eggs one at a time, beating for 30 seconds after each addition and scraping bowl. Scrape in the melted white chocolate and beat on medium until blended. With the mixer on low (or you can do this by hand), add the flour and the sour cream alternatively, beating until blended. Stir the white chips into the batter and scrape into pan. Drag a knife or scraper through to even out the batter, then bake for 55 minutes (up to 60) at 350. The top will brown and the whole kitchen should smell great! Allow the cake to cool on a rack for 15 minutes, then invert onto a wire rack to finish cooling. In a microwave-safe bowl, heat 8 ounces coarsely chopped white chocolate with l/2 cup heavy cream on High for 30-second intervals, stirring after each interval, until smooth. Let cool slightly, then drizzle over the cake. As a decorative accent, melt some semisweet chocolate and drizzle it over the white. This cake looks good! One of my favorite cakes to make is the Daisy Sour Cream Chocolate. I once left out the baking soda. The layers were like hockey pucks. That was an immediate remake. Does that book also have the Mrs. Fields coconut cake in it? I highly recommend it. I have been making it for many years. Stephanie, since you have the cookbook I will also recommend the Chocolate Carrot Cake. It sounds kind of weird but is actually very good. I posted it a while back but it’s also in the book. I know I’ve made a few other things from the books but can’t recall off the top of my head. I have this cookbook too and I found that a lot of the recipes in it were actually very good. I’m glad you reviewed this recipe and will give it a try. Jen, if you try the White Chocolate Whisper Cake before I do, let me know. I believe I am one of the very few people who prefers white chocolate. I want to try this and the White Chocolate Whisper Cake. I hope you make it again soon with the sour cream. I’m wondering if the sour cream will cover up the white chocolate? Your photographs are really pretty! Thanks for sharing that you do stuff like forget major ingredients. It happens occasionally to me and I’m so hard on myself when it happens. Yes! Go for it, T! This would make a very good Easter dessert.